New York City Opera will present the world premiere of Ted Rosenthal's jazz opera Dear Erich on Jan. 9, 10, 12 and 13 at the Museum of Jewish Heritage, at 36 Battery Place in New York City. Rosenthal sat down to talk about the piece with WBGO's morning host, Gary Walker. Dear Erich is inspired by 200 newly discovered letters written in Germany between 1938 and 1941 by Herta Rosenthal to her son Erich, the composer's father. "I decided to take out the attic a box of letters that had been sitting in my attic for more than 10 years," Rosenthal says. This was a box of letters that my grandmother wrote to my father. He was able to escape Nazi Germany in 1938, by virtue of a fellowship to the University of Chicago. Unfortunately, most of his family, including his mother, my grandmother, were not [able to escape], and they perished. As is typical among Holocaust survivors, he spoke almost nothing about his family, and nothing of the letters. This occasion prompted me to discuss the letters with a man named Dr. Peter Schmidt, who was also a character in the opera, a very heroic character. He translated first just a few of the letters, and then all 200-plus. This process of reading these translated letters, and getting to a know a family that I really knew nothing about — my grandparents, uncles, aunts, cousins, some of whom had musical talent unknown to me — inspired me to begin work on this jazz opera, Dear Erich. Rosenthal says Dear Erich is relevant now. "We're trying to capture the immigrant experience," he says. "You know, we are surrounded by immigrants, and the idea that you come to a new land and you have hope and interest in creating a new life, but you have family back home. This push and pull of looking forward and looking back is one of the central themes of the opera." So where does jazz come into this opera? Rosenthal says when Erich, his father, is kicked out of school in Nazi Germany and comes to America, he is greeted, in the opera especially, by jazz. "And by all the characteristics we associate with American Jazz — the freedom, the democracy, the swing, the improvisation — and this is representative of this hopeful new life he will lead in America." For more information about Dear Erich, visit the project website. The Kleinmann Family Story Told in the Holocaust Book "The Stone Crusher"
Kurt Kleinmann lives in Pompton Plains, New Jersey and has been married for 61 years. The military veteran had a very successful career in pharmacy and was a long-time ski instructor. But how Kurt got to the United States and what his family went through is the subject of the new book from Jeremy Dronfield, The Stone Crusher: The True Story of a Father and Son's Fight for Survival in Auschwitz. The bottom line at Auschwitz is, eighty percent of the people who were sent from Hungary, Jews, upon arrival in the gas chambers. The other twenty percent will be sent to slave labor camps all over Nazi occupied areas. I see people dying all around me. They’re dying of hunger, dying from diseases, accidents on the work sites from really hard labor. They’re going to kill you. One morning we are standing at attention when an S.S.
A play now on Broadway tells the story of a play that became a scandal a hundred years ago — in Yiddish. Theater Critic Michael Bourne reviews Indecent.A play now on Broadway tells the story of a play that became a scandal a hundred years ago — in Yiddish. Theater Critic Michael Bourne reviews Indecent. As we savor the season, WBGO looks back to a session from 2013, when the Ted Rosenthal Trio came in to share music from a new holiday album. 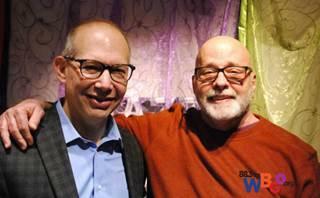 The Ted Rosenthal Trio performs songs from 'Wonderland' at WBGO, Dec. 5, 2013.